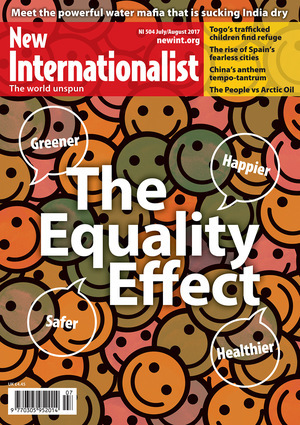 The Equality Effect issue (NI 504) is very good – just a couple of things: Aotearoa does not have a NZ Democratic Party; none of the main parties, including the Green Party, are supporting a living income; with elections in a few months they are far too afraid of upsetting big business! The Greens are becoming rather a pale green. Also, need to keep up with the situation of New Zealanders in Australia: even those who have lived and worked there for years cannot access welfare, health and education benefits. I read you because I understand the magazine as an attempt to continually supply the evidence and theory necessary for lefty or progressive thinking. That’s why I was so curious at last issue’s (NI 504) feature on the history of egalitarian societies. There certainly is a swathe of archaeological, anthropological and psychogeographical evidence as to the egalitarian societies and cultures that preceded much of recorded history. Yet I’ve heard no-one claim that weaponry allowed more egalitarianism, indeed often quite the opposite. Weaponry leads to disproportionate individual power which in turn leads to hierarchy. Gibbons have egalitarian social structures without any tools. I’d either be fascinated to read the evidence, or desperate for you not to mislead people with dodgy claims about egalitarian prehistory, especially when there’s actual evidence available, say, as to the communal nature of neolithic burial mounds vs bronze age cist graves in the UK. The article on the Kim dynasty (Worldbeaters, NI 503) concludes that ‘the international community needs to make them feel more, not less, secure’. This is sound advice when the world is faced with an unstable leadership and an unpredictable administration. Meeting irrational threats from North Korea with sabre-rattling and the mobilization of aircraft carriers will not work against a regime so isolated and superstitious of Western motives. It is estimated that the DPRK will have up to 60 nuclear warheads by 2020, a frightening thought when the codes will be in the care of someone as aggressively erratic as Kim Jong-un. This is a leader who has no qualms in disposing of his immediate family as well as his subjects. One of his former inner circle O Sang-hon, who was charged with treachery and being a counter-revolutionary, was reportedly executed by flamethrower. Kim Jong-un had his half-brother Kim Jon-nam assassinated in February this year at an airport in Malaysia, as well as disposing of his Uncle Jang Sung-taek in December 2013. Kim Jong-un does have a back-up plan and could retire comfortably with his estimated fortune of $5 billion, most reckoned to be stashed in European banks. In the meantime North Korea Uncovered, a comprehensive mapping of the country has exposed missile-storage facilities, mass graves, secret labour camps and numerous palaces throughout this isolated communist outpost. The object of the West should be to build better relations with North Korea through China, its northern neighbour and closest ally, both ideologically and economically. The trigger-happy head of state of an unstable regime is not someone the US, Japan or South Korea wants to push too much.